TS New DA @25.676% GO.55- Dearness Allowance 1.572% Sanctioned to Telanagana State Government Employees from 1st July 2017. 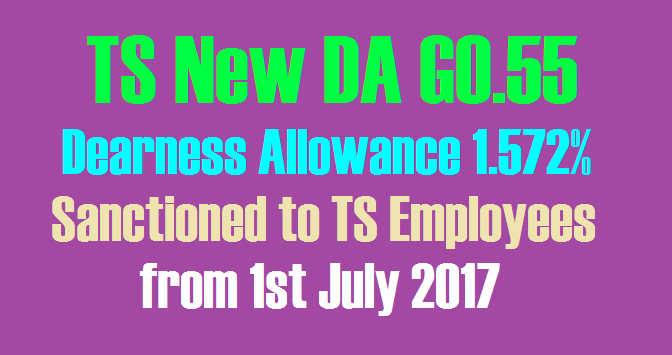 TS New DA @25.676% GO.55- Dearness Allowance 1.572% Sanctioned to TS Employees from 1st July 2017 TS GO. MS 55 Dt.17/05/2018 Dearness Allowance to the State Government Employees from 1st of July, 2017 – Sanctioned – Orders – Issued . The arrears on account of payment of Dearness Allowance for the period from 1st of July, 2017 to 30th of April, 2018 shall be credited to the General Provident Fund Account of the respective employees. TS GO.55DA 1.572% Sanctioned to Telangana Employees, Teachers from 1st July 2017. DA enhanced from from 22.008% of the basic pay to 25.676% of basic pay from 1st of July 2017. For CPS Employees 10% of DA Arrears from 1st of July, 2017 to 30th of April, 2018 shall be credited in to PRAN A/Cs. And remaining 90% of DA arrears shall be paid in cash. Cash from 1st of May, 2018, payable on 1st of June, 2018. ALLOWANCES – Dearness Allowance – Dearness Allowance to the State Government Employees from 1st of July, 2017 – Sanctioned – Orders – Issued. 7. G.O.Ms.No.135, Finance (HRM.IV) Department, dated 22-09-2017. 24.104% of the basic pay to 25.676% of basic pay from 1st of July, 2017. 3. Government also hereby order revision of the Dearness Allowance rates in respect of State Government employees drawing the Revised U.G.C Pay Scales, 2006, from 136% to 139% of the basic pay with effect from 1st of July, 2017. 4. Government also hereby order revision of rate of the Dearness Allowance in respect of Judicial Officers whose pay scales were revised as per Shri E. Padmanabhan Committee Report vide G.O.Ms.No.73, Law (LA&J, SC-F) Department, dated: 01.05.2010 from 136% to 139% with effect from 1st of July, 2017. Revised Pay Scales of 2010. 6. Government also hereby sanction an ad-hoc increase of Rs.100/- per month in cash to the Part-Time Assistants and Village Revenue Assistants from 1st of July, 2017. 7. The Dearness Allowance sanctioned in the paras 1-5 above shall be paid in cash with the salary of May, 2018 payable on 1st of June, 2018. The arrears on account of payment of Dearness Allowance for the period from 1st of July, 2017 to 30th of April, 2018 shall be credited to the General Provident Fund Account of the respective employees. 2018, the arrears of Dearness Allowance shall be drawn and paid in cash as the employees due to retire on superannuation are exempted from making any subscription to the General Provident Fund during the last four months of service. 01.09.2004 and are governed by the Contributory Pension Scheme (CPS), 10% of the Dearness Allowance arrears may be claimed in the Month of July, 2018 and shall be credited to the PRAN accounts of the individuals along with the Government share as per the existing orders. The remaining 90% of Dearness allowance arrears shall be paid in cash, with the salary for the Month of June, 2018, payable on 1st July, 2018. 9. The Drawing Officer shall prefer the bill on the Pay & Accounts Officer, Hyderabad, or the Pay & Accounts Officer/ the Assistant Pay & Accounts Officer of the Telangana Works Accounts Service or the Treasury Officer, as the case may be, for the amount of arrears for the period from 1st of July, 2017 to 30th of April, 2018 to be adjusted to the General Provident Fund Account in the case of an employee who has opened a General Provident Fund Account. the pay bills of the Office concerned for the month of July, 2018 unless a certificate is enclosed to the bills to the effect that the arrears of difference in Dearness Allowance for the period from 1st of July, 2017 to 30th of April, 2018, are drawn and credited to the General Provident Fund Account before 30th of June, 2018. 12. In respect of employees working in Government Offices in the Twin Cities, the Pay and Accounts Officer shall consolidate and furnish information in the proforma annexed (Annexure-I) to this order to the Finance (HRM.IV) Department to reach on or before 31st of September, 2018. 13. All the Audit Officers (Sub-Treasury Officers) are requested to furnish the figures of the amount credited to the General Provident Fund Account and the amounts credited to Compulsory Savings Account in the prescribed proforma (Annexure-I) enclosed, to the District Treasury by the end of 15th of September, 2018. Government by 31st of October, 2018. 15. In respect of employees of Local Bodies, the Drawing Officers shall furnish the above information in the prescribed proforma as per Annexure-II to the Audit Officer of the District concerned before 15th of August, 2018 and who will, in turn furnish the consolidated information to the Director of State Audit by 15th of September, 2018. The Director of State Audit in turn shall furnish the consolidated information to the Secretary to Government, Finance (HRM.IV) Department by 15th of October, 2018. 16. In regard to the Project Staff, the Joint Director of Accounts of each Project shall furnish the information in the prescribed proforma as per Annexure-II to the Director of Works Accounts by 15th of September, 2018, and who, in turn, shall furnish the information to the Finance (HRM.IV) Department by 15th of October, 2018.